Growth in the edible landscape is happening in leaps and bounds with May's generous doses of warm rays and the belated setting sun of spring. So rapid is the growth, in fact, that many of the pathways created to be 18"- 24" wide have been obstructed by sprawling veggies, herbs, and flowering plants. Harvesting of eightball zucchini, summer squash, green beans, carrots, onions, peppers, herbs, peas, and tomatoes is steadily increasing. Heirloom seeds of rattlesnake pole beans were planted this year from pole beans that were dried from last year. That's a first for me. What pureness. Food reproducing food we can trust. Not as many were planted this year as in the past. 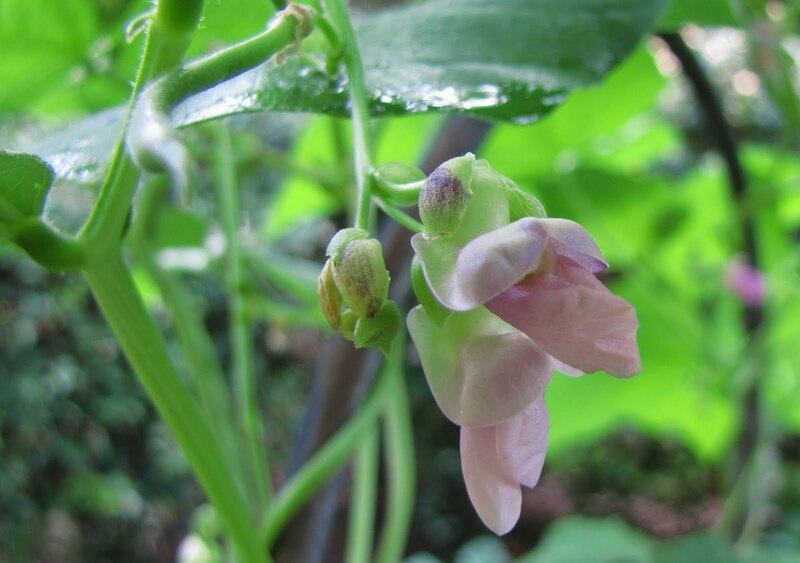 They were set to climb a more slender trellis. Sown a little later than the rest of the garden pole beans are just beginning to fruit. Exciting news as we are beginning to see the bulbs forming on the Red Creole onions tried for the third time. Maybe we'll have some success this time. The Tokyo Long White-Bunching are looking good next to them. Lettuces are being missed greatly as it turned bitter with the warm temps. Good thing we still have some clear passage between the perennial border and the veggie beds. The cuccumbers were threatening to claim all the space in the center bed. But in the last couple of days have succumbed to some sort of fungus. Sprayed them with GreenCure and hoping they will survive and produce. Golden Globe Lysimachia as ground cover near the sitting area came back from the frost of winter. 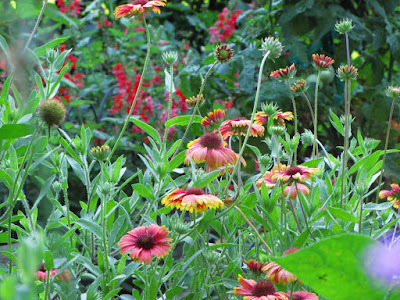 Planting seeds of Gaillardia blanket flower may have been one of those forgetful moments as they really do blanket. But with the edible garden being one of the sunniest spots in my garden it is so tempting to put more flowers there than should be. Carrots both from heirloom seeds and hybrids supposedly sweeter for the heat look great. But truthfully, I don't think they are as sweet as when harvested in the cooler weather. They sure are pretty growing with their feathery green tops! Some will be left in the ground just for the swallowtail butterflies to find and lay their eggs. A few plants of blueberries, flat leaf parsley, rosemary, and bronze fennel were added as landscaping in the back gardens. 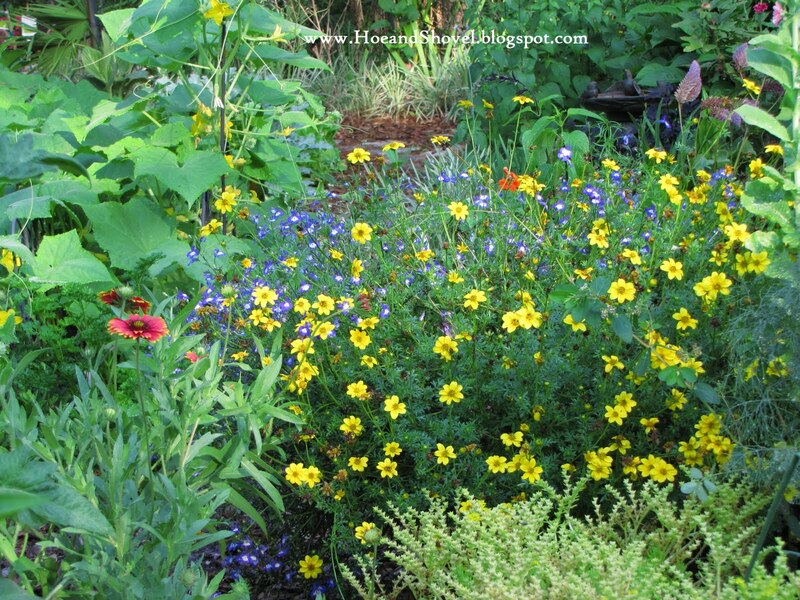 It is very fun to see edibles mixed in with everyday perennials. Oh, those elusive tomatoes! The plants were looking great and this plant still does. Out of 5 plants this one looks the best. 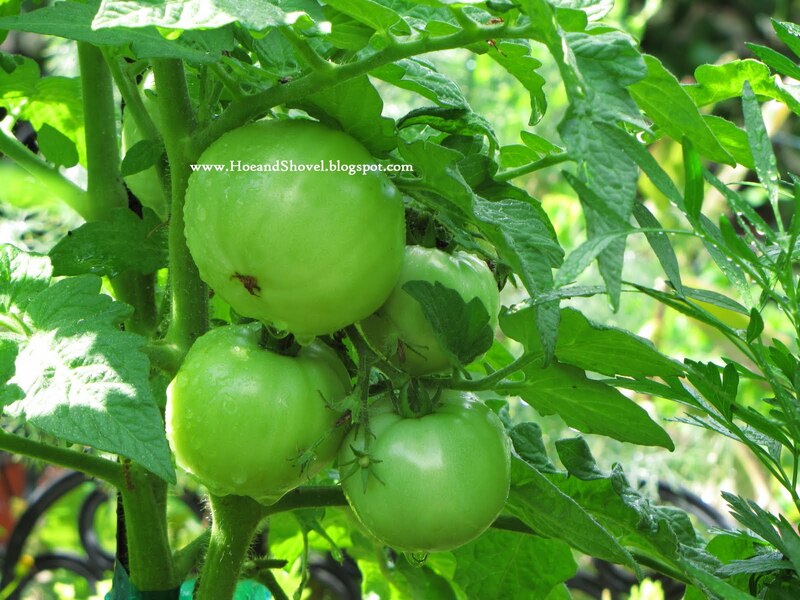 They all have tomatoes ripening and several harvested in the past week. The worms have been awful and surprisingly very few aphids. No pesticide usage means a lot of attention and picking off of insects. This morning I found my very first tobacco hornworm. Wow. That guy was ginormous. I really hope he was alone. A remarkable appetite he had overnight on stems. Not just leaves but stems. But for this season we are celebrating the successes, making notes, learning more lessons and enjoying the fresh eats we are blessed to cull out of our very own edible garden. Gosh Meems, your garden looks lovely and lush. I love the flowers and veggies mixed in together. I am always amazed to see carrots that are grown at home. Yours look lushous. With your encouragement I have tried a few veggies in the garden. It is fun to have a pot of lettuce. I might get really invigorated next spring and do a raised bed. There is always something new to try in the garden. Veggies have the tastiest results. Your veggies look scrumptious. I have had good results from bell peppers and grape tomatoes this spring but my other seedlings didn't make it. I'm hoping for a better fall season. I just love the way you have flowers in with the veggies. Even though I container garden my veggies I've been inspired by you to include some pots of flowers to pretty things up a bit. Hi Meems- I've been lurking for about a month now. I'm brand new to gardening and am trying to "soak it all in". I love your blog- thank you for sharing your art. What I've been studying and trying to figure out is your foundation plantings; how do you come up with a layout? The house we just moved in to was a rental for 15 years and has ZERO landscaping. ZERO. So I'm starting from scratch everywhere and keep getting frustrated and impatient. Any advice? Meems -- you are a garden superhero (hand-picking bugs off of the veggies!?!) I'd faint dead away! With so much activity (and crime fighting the varmints besides) - that's a fulltime job! AND year round! WOW!! Your garden is looking very lush and full. I love the way your veggie beds look like flower gardens! So pretty. It all looks great Meems. My tomatoes are doing good for a change. 3 yrs in a row they didn't do at all. Maybe this yr. will be different. Carrots have pretty tops but the root isn't so good. It could be that they don't get enough water. I've planted in huge pots & sometimes it's hard to keep all watered right. Your Veg garden is looking good. I had found several hornworms on my Tomato plants. Everytime I thought I had them off the next day there would be another one.There was even a Mockingbird helping me to pluck them off the plant.He likes the Everglades Tomatos also.Between the two of us I think we got them all now. Your garden is so healthy and what healthy produce you gather, too. Just watch that bronze fennel. I'm still pulling out the thousands of offspring around 3 plants that I did not deadhead last fall. We have harvested cabbage, squash, lots of carrots, tomatoes are about to start turning. 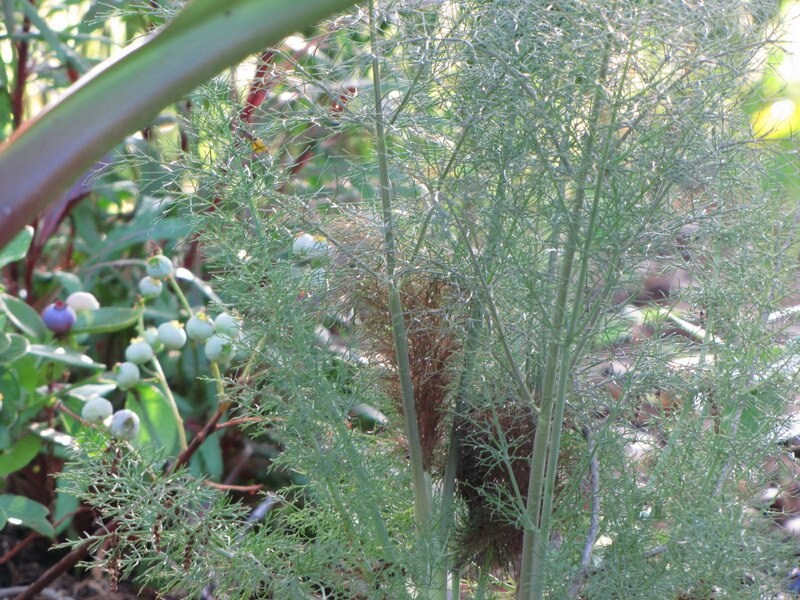 Don't you love the bronze fennel? So, post a how to on growing onions...I have not had success as of yet..still trying though. Your garden always looks so lush and abundant, Meems. 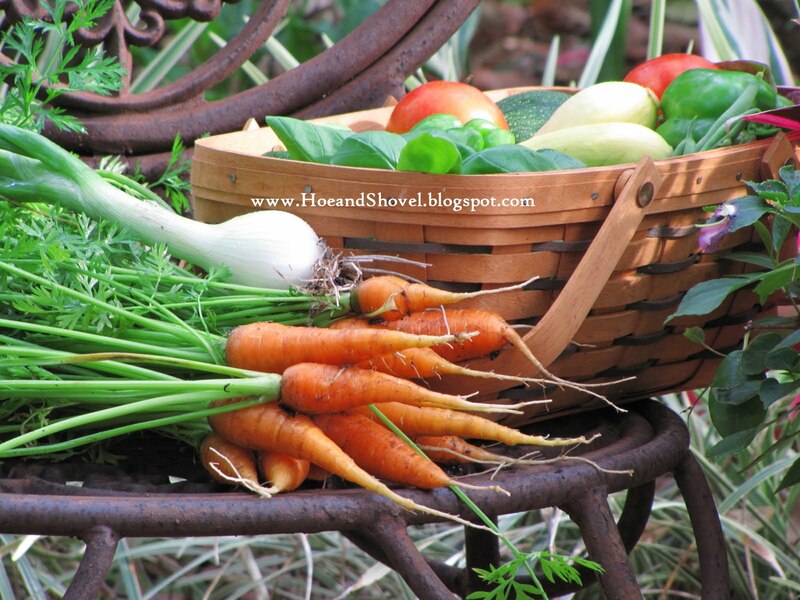 I wish I had the room for a veggie garden -- those carrots look amazing! 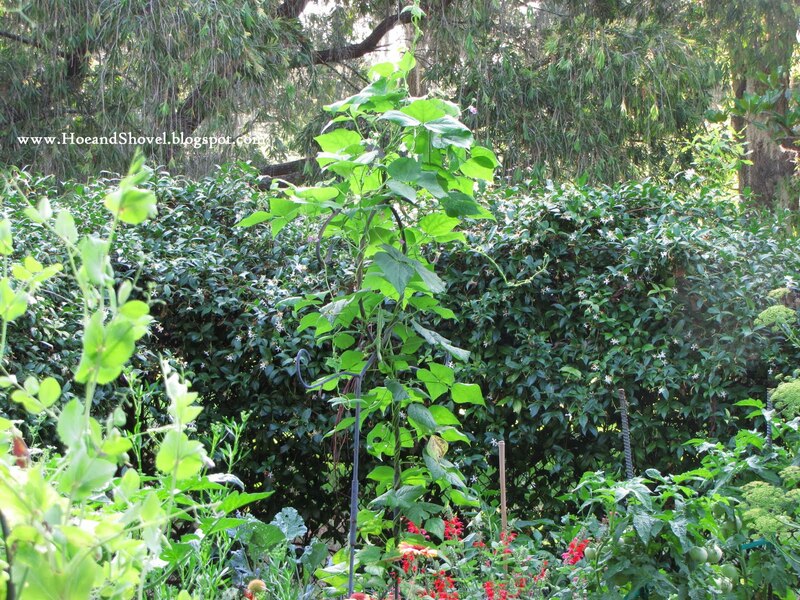 Your veggie garden is not only beautiful but quite productive, too. Fresh veggies are always so much better. The flowers on the golden globe are really nice. Is that a basil? Thanks for the GreenCure tip. Will try it. Mixing the flowers with with veggies and vice versa just feels more natural. 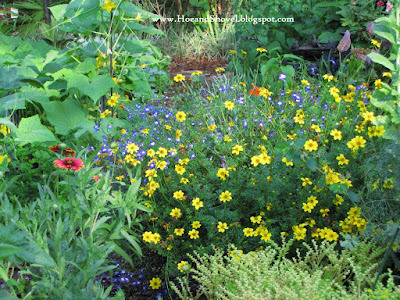 Even though the veggie garden has very different time-lines than the perennial beds it blends better with my philosophy of gardening to have it all flow together. I'm so excited to hear it! So happy you're branching out with a few veggies. It can never hurt to try something new. I wish you all the best! Now that everything is said and done I really wish I would have started some grape tomatoes. They do so well for longer than the slicers. I'm convinced fall is easier but even that depends on the weather's fickle ways. Don't you enjoy the veggie area more when it blends in with the whole landscape effect and 'pretty' is added? It does wonders for the soul. How exciting to have the opportunity to start from scratch. You can think it out ~~ make a plan and tackle it in pieces. Start with trees! Decide where you want trees and work around them. Here is a link to a great Florida-Friendly website where you can do an Interactive Plan for your yard.. Read through the site for some really good, basic information. 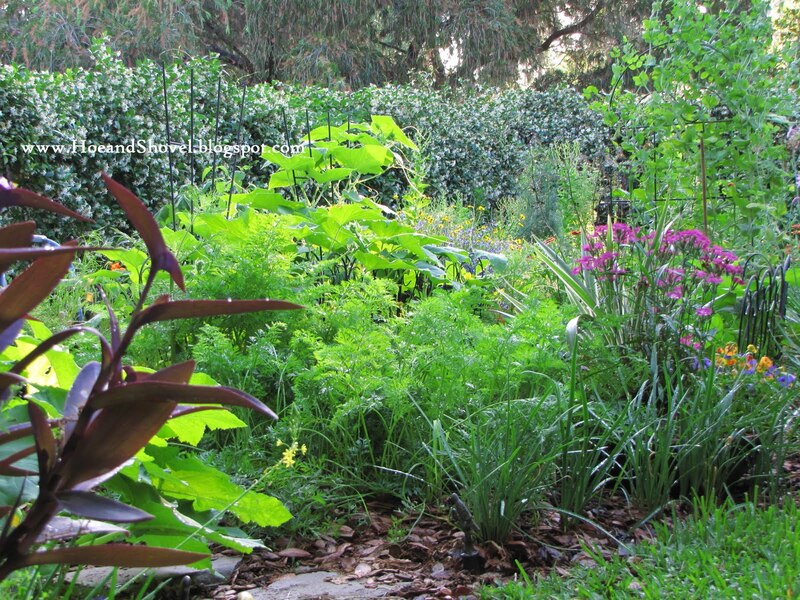 It also offers a plant database for each area of Florida. Then I'd suggest you start with the area(s) that matters most to you. For example the front entrance or maybe there's a place you like sit in the back yard or porch. Make that space very appealing to you and to the wildlife so you'll have the added bonus of watching the nature around you. Then work out from there. Don't be overwhelmed. Time is ticking by ~~~ you might as well be growing plants/trees while it does. 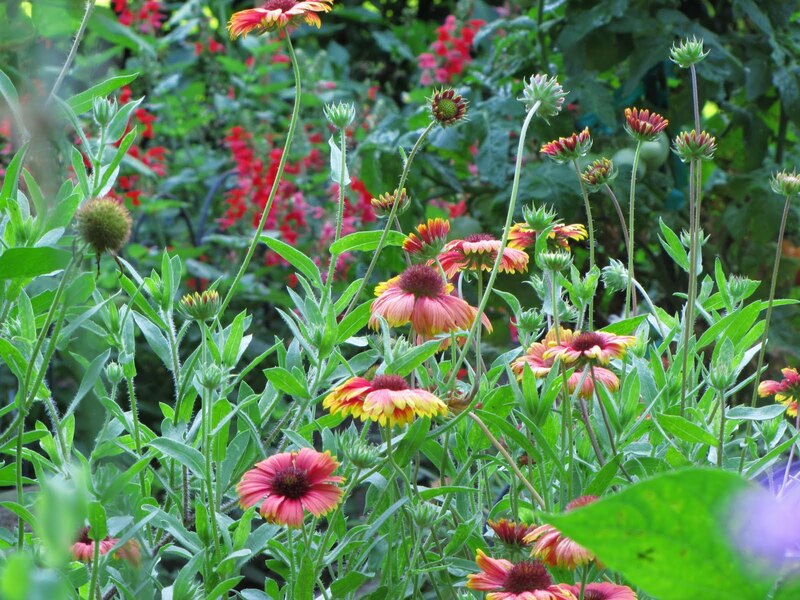 You could also find some garden blogs in your area that hopefully grow the types of plants you'd like to plant and you can read (and learn) how they've worked for them. I hope that helps. Visit often. We love the company. If you wannabe... then you cannbe! And I have a feeling you willbe! Most of the time I have gloves on but I have squashed so many lubber grasshoppers bare-handed it is disgusting. Mixing the flowers in with the veggies and creating the edible beds to curve and flow like the rest of the landscape seems so much more natural to me than 'separating' it out. It is definitely located in its own side of the yard but it blends with everything else this way. Yay for tomato success. I definitely don't have it perfected ~~ still feel it is a hit and miss proposition. But I'll forever give it a try each season. The watering thing is the hardest part for all the edibles... in my thinking anyway. I'm sure I overwater the tomatoes some days. Keeping edibles in pots presents an even bigger challenge in that area. Those guys are remarkably big eaters. 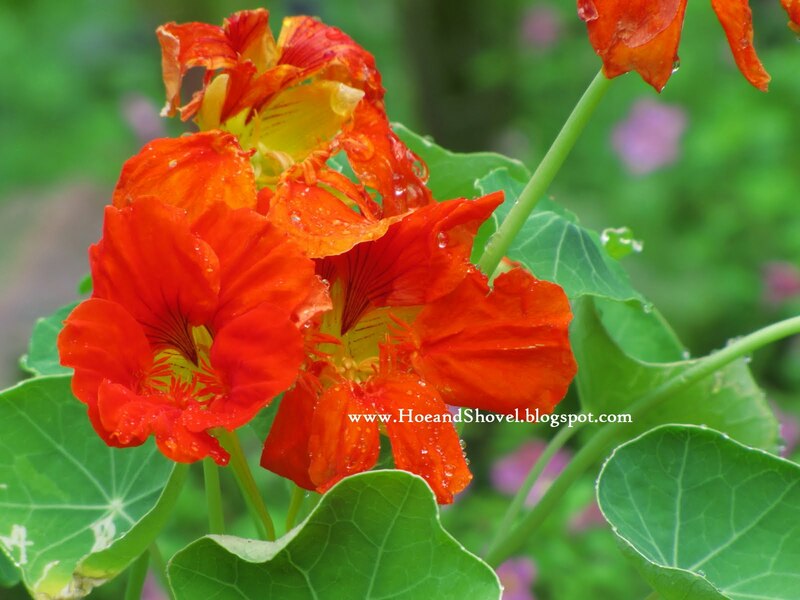 The gardener does have to stay after them as they can do some enormous damage in a short period of time. Sounds like you've got it under control finally. 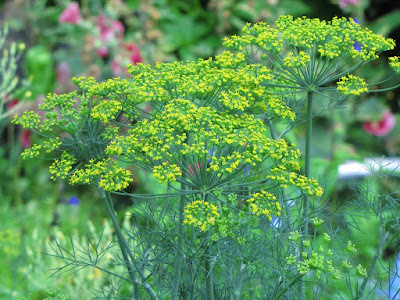 It will be interesting to see if the bronze fennel is as hardy down here. It isn't an herb readily found this way ~~ which is why it is my first try. The swallowtails like it for laying eggs which is a bonus. I've not got it figured out enough to post a how-to. I planted from seed this year but also from sets. The sets have done very well with little effort. The one in the photo is one of them. Next season I will plant more from sets. 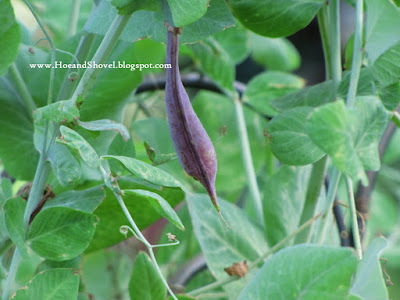 The ones from seeds hardly came out of the ground the first two times I tried them (last spring and then last fall). Last spring something would eat them as soon as green showed up. Then in the fall I'm pretty sure my interplanting location next to the tomatoes didn't offer them enough sunshine to mature. This spring I gave the seeds their own rows. Isolated and not crowded. They are producing onions. That's all I know. 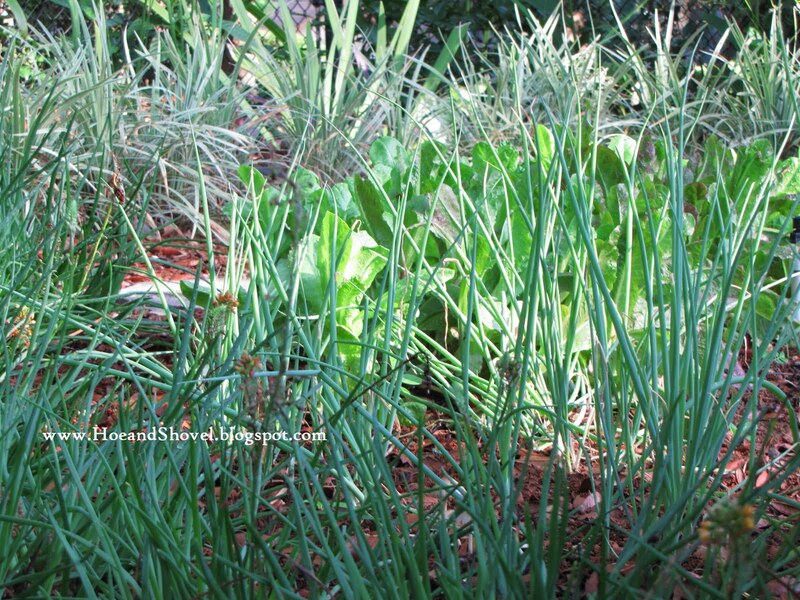 Wish I could say for certain ~~ but likely it is sun as even the few onions I planted from the sets that are under the tomatoes again are not getting enough sun and are not as large as the ones I planted as soldiers lined up in more sun. Hope that helps. Someday, Nancy, I just know you're going to have land again. Then you'll have your veggies. I'm cheering you on for all your dreams to come true. Some of the edibles have done better this season for longer. No rain and a more controlled watering system has been key... I think. 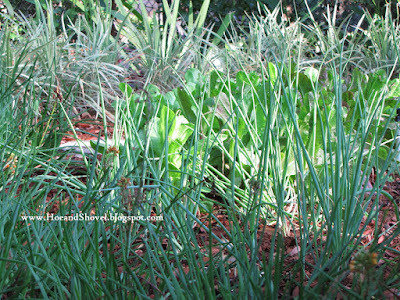 Do you remember the 4 or was it 5 straight days of rain we had last May that pretty much wiped out the veggie garden? This year the biggest challenge is once again the intense humidity so early starting in April. 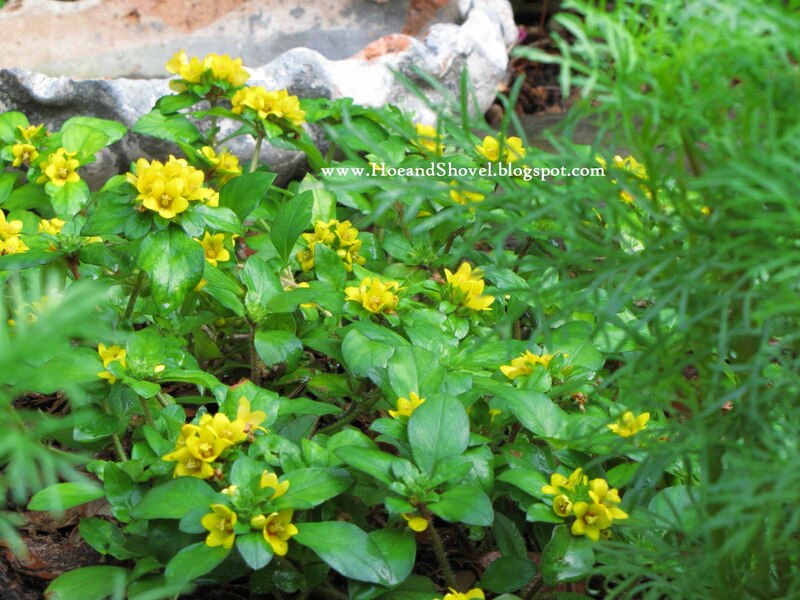 Golden globe is a ground cover and not a type of basil. Typically I'm not one to mess with sprays and pampering. But I am determined to figure out how to be more successful with the Cucurbitaceae family! Thanks Meems for all the good advice. I am *trying* to make it as Florida-friendly as possible (the yard is big- over an acre, half of which are orange groves, so it's daunting!). 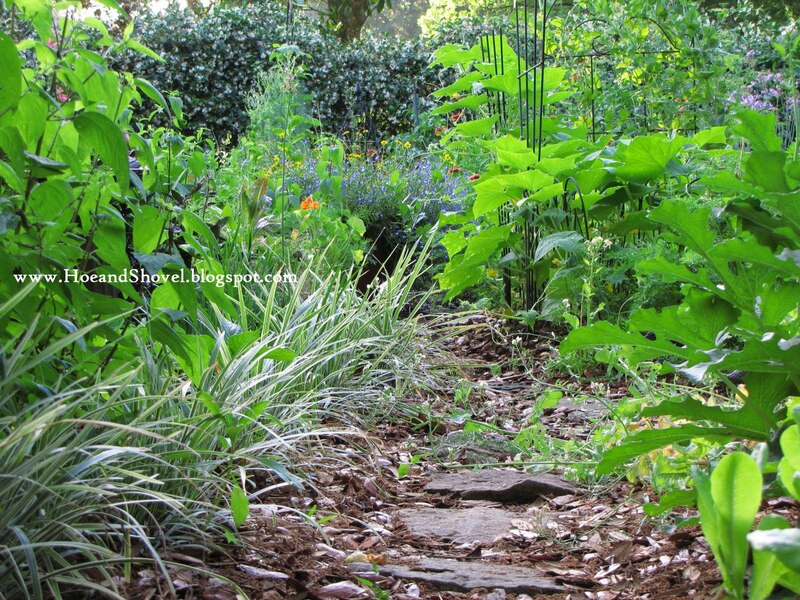 But I don't like the "native" garden look, you know what I mean!? We have tons of trees already- a beautiful Royal Poinciana, several Junipers, and of course lots of cabbage palms! The problem is I am so impatient. I plant things and it looks so bare and so I plant more. I want the mature look NOW. I keep looking at your front yard renovation and looking at the July vs September photos and keep saying to myself; "look how much things have grown for Meems in just a few months!". It keeps me motivated. I'm still trying to pull from your foundation plantings in that area to learn about spacing etc. My gardening style has evolved to mix our beautiful Florida Friendly plants with natives for a more naturalistic appearance. 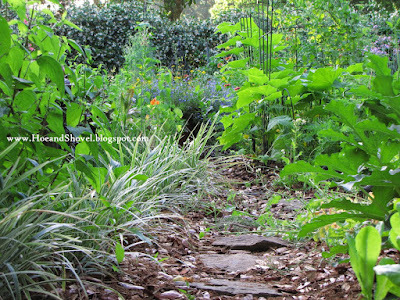 More in the back gardens but the front has areas with lots of saw palmettos and oaks layered with FL Friendly plants ~~ all of them foundational plants. Your property sounds divine! What could be better than already having mature trees to start you out. 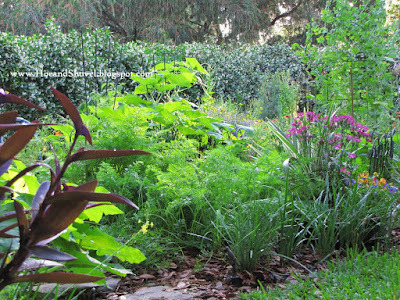 All that citrus and cabbage palms are a great bonus. I can understand though how wanting it to have cohesiveness right away could be frustrating. Again, I can only tell you as an impatient gardener myself (more in my younger years than now- I'm still learning patience)you will get a few down the road and the sense of accomplishment will help your impatience. Choose parts of your garden to work with and make them all you want them to be rather than trying to do a hit and miss with a little here and a little there. I think you will realize more impact that way. The tomatoes do hang on the vine for a long time... nice and green and plump. Believe me, I am tempted to pull mine off when they begin to show the slightest start to turning. My head says "pick them now before anything has a chance to destroy them." But leaving on the vine until ripe add sweetness. You can do it either way because left out on a ledge or in a basket they will turn ripe eventually even if you pick them green. I wish you the best with all your adventures. i have been meaning to tell you how much i love the chair we found in anna maria. it looks picture perfect in your garden. do you ever sit in it? i bet not. i don't know if you saw but i found a wrought iron bed and put in in the herb/veggie/fruit garden just outside the fenced in veggies. i planted cucs and beans to grow up the posters. 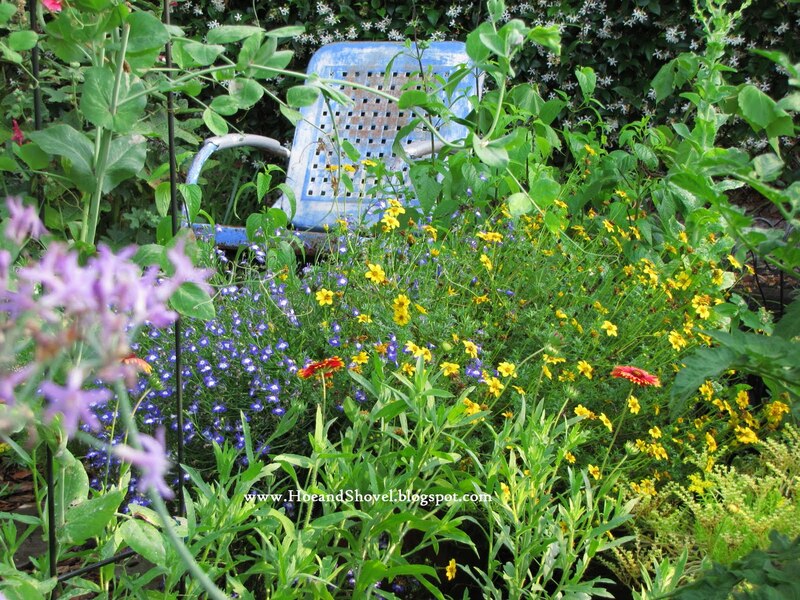 butterfly bushes in the middle and wildflowers around the outside. i really love the look of the eight~ball zucchini...almost like perfect little pumpkins. we did not do nearly what we did last year and it feels more manageable...plus we are leaving to often this summer. i love seeing all your edibles. we've mostly had herbs so far. can't wait for the rest. enjoy and glad to hear e and g were there to enjoy some goodies from the garden. Everything looks so lush and abundant. I'm craving those delish veggies. Once again,beautiful photos. Another pleasure in the garden to have the subject to photograph. As you've guessed I don't sit in the retro lawn chair. But it has turned out to be used by Mr. Meems a few times in the shade of the late evening hours. The little ones like to get in it and rock. It's kind of being encompassed by the stray cosmos seedlings at the moment. So happy you've found your wrought iron bed to plant in... I picture it to be just as you imagined... all dreamy and romantic with veggies climbing its posts. I'm thinking you are wise to scale back and feel manageable. Really had a great time with everyone here for a couple of days. So glad to have them close by. You and me both. Fresh veggies are something I never tire of eating. Glad you stopped by. The veggie garden has definitely not gotten as much of my attention as in past seasons but it is holding out okay in spite of that fact. What an amazing garden and a skillful photographer. I live in Orlando and would love to see it sometime. The bugs and humidity are coming out in force now. I've pulled 5 tomato plants so far, however the Chinese yellow cucumber seems very resistant to both. What happended to your rhubarb harvest? I always look forward to that!